This warm winter makes the creek scream like spring. Smooth stones, slick, cold life, years in my hands. My fragile blood beats, knows the water by heart. where it licks up upon the shore, sure feet are never a given. It can bite you, gently, or with unforgiving teeth. I head for snow level, it’s high for this time of the year. Pine needles dot its surface like a mild sprinkling of spice. An echo between their voices, moves with the forest, downhill. There, below, near the river and I-84, the creek is a maiden jumping. attempt to catch her in the act of hitting the ground. I’ve been there. That area of Oregon is incredible. This is descriptive imagery which transports the reader to a very real place. Nice piece. I can smell the earthy woods too. Chris T.
Makes me want to visit there! Beautiful! I know this place! Thanks for taking me back there. Yes, the gorge is rather steep from the Columbia on the Oregon side. There’s a couple of trails that had me on my hands and knees. At the time I lived in the city and only hiked on vacation. Now I hike almost every day near where I live. Trees might fall and land slide, unperturbed she doesn’t stop… Rivers, creeks, flowing water have such a life of their own, I can only witness and admire. I love how your words and photograph capture all this for me. Oh wow! I was right there! “… years in my hand” – love it! I often touch rocks and trees for their presence there, long before mine. Your wonderful images bring the water alive. I’ve seen the Falls but only from the bottom looking up, a pale imitation of your poetry. My husband and I hiked there on our honeymoon on the way to Hug Point. Your description compels one to hear, smell, feel and experience the beauty. Thank you for sharing that beautiful piece. Beautiful, both words and photo! Thanks so much! 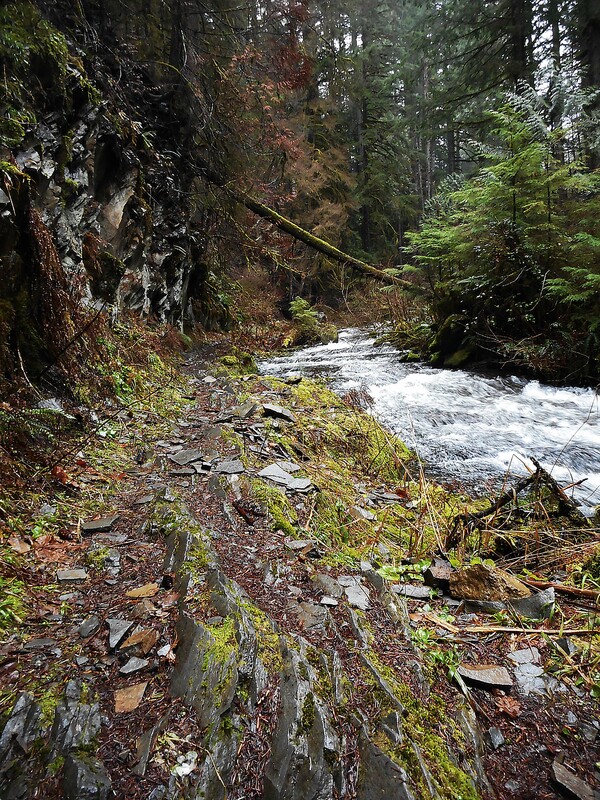 In the spring, if the snowpack has been deep, this part of the trail is taken over by the river. You can see how it has carved its path. Nature is lyrical in it’s own right. You captured it’s essence perfectly. I saw a transition from the speaking of the Fall’s history to the modern age of Selfies…cool. Beautiful your words and they take me back to my honey moon. My husband and I hiked the trails and when we got to the top we warmed ourselves in the sun and took pictures of our wedding rings under the crystal clear water of the creek back in 1996. Thanks for the precious memories. She does refuse to pose!